Yes! 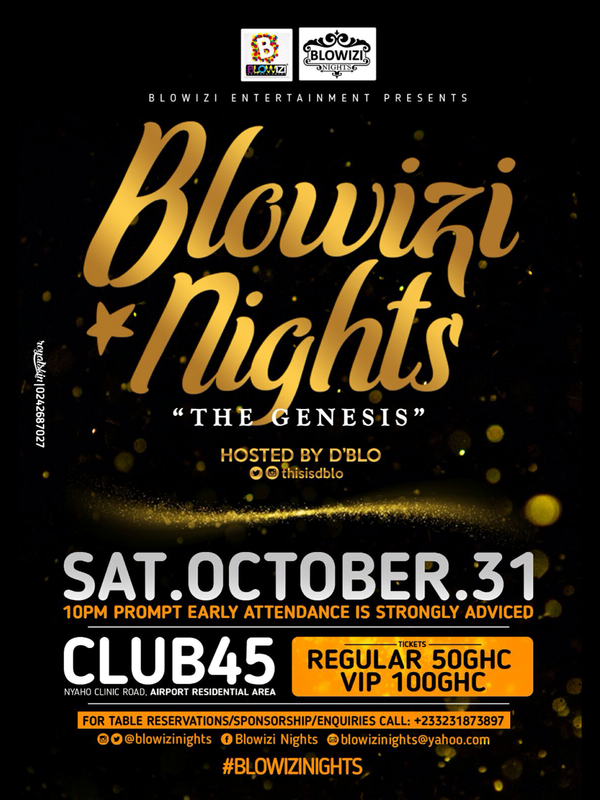 Blowizi Entertainment introduces ‘Blowizi Nights’, the coolest rocks to hit the city of Accra, Ghana. Founded by Daniel Ntui a.k.a D’Blo, Blowizi Nights, dubbed Ghana’s Ultimate University Party, seeks to present university students with the ideal platform to meet and network with students from various universities in Ghana, while simultaneously enjoying good music, drinks, shisha, and generally catching unmatched cruise in a relaxed and conducive environment. If you thought you wouldn’t attend a university party till you’re done with your studies; or the ones you’ve heard of or been to haven’t cut it for you – think again ‘cos that’s all about to change. Blowizi Nights offers students the opportunity to party their hearts out once every semester. This amazing event aims to promote and shine the spotlight on students inclined towards arts and entertainment. Thus, the party will feature performances by artistes, display by fashion/graphic designers and lots more. Furthermore, what’s a party without chops? Arrangements have been made for some “medemedes”; kebabs, sausages, and sharwama. As you allow Blowizi Nights redefine the partying experience for you, be the first to know what we are upto by connecting with us on all major social media platforms: Instagram/Twitter – @blowizinights Facebook – Blowizi Nights. For enquiries or sponsorship, call: +233231873897. This entry was posted in activities, Ads, events, events, activities and tagged accra, advertisement, blog adverts, blowizi nights, Entertainment, Fun, ghana, leisure, party. Bookmark the permalink.